December is almost here, and along with it comes holiday party season. While I love a new party dress as much as the next girl, I'm also a big fan of giving the clothes in my closet a fresh look with costume jewelry. A distinctive bracelet or necklace can do wonders, breathing new life into a staid LBD or brightening up a plain frock. 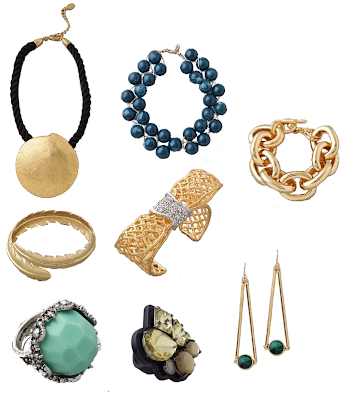 For costume jewelry that won't break the bank, you can always search the accessories aisles of Forever 21 or H&M, but won't one of these luxe picks from Shopbop be positively dreamy for a Christmas or New Year's fete? I can't even pick a favourite amongst the bunch. Can you? I'm trying to master accessorizing old clothes. This is a great guide. They are all so pretty. While I usually go, without hesitation, for anything with a bow - this time I'd say my favorite is the feather bracelet (they're all pretty though!). I am so bad at using accessories. I feel like i need a tutorial every time! Well, I like them all. But if I had to pick a favourite, it would be the Theodora & Callum sand dollar -- I'm a sucker for chunky gold things. Ooh I love that rock ring!